The ggmap package caused a buzz at UseR! last month. Well, anything gg-something plus anything to do with maps will do that. It lets you download map tiles to use as backgrounds to ggplot graphics, and has some other useful functions such as interfacing to google's routing engine and geocoding. 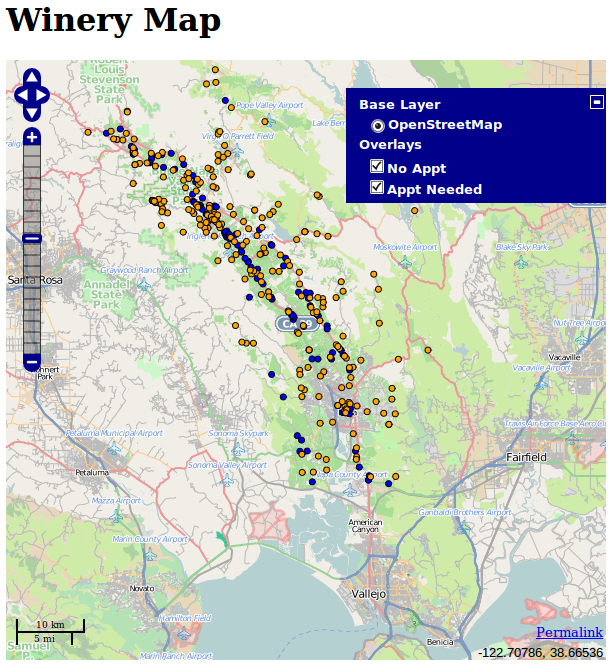 That map shows me one thing - that the wineries that you don't need an appointment for tend to be close to the main roads, and the ones you do need an appointment for are up in the hills. Its a static, dead map. 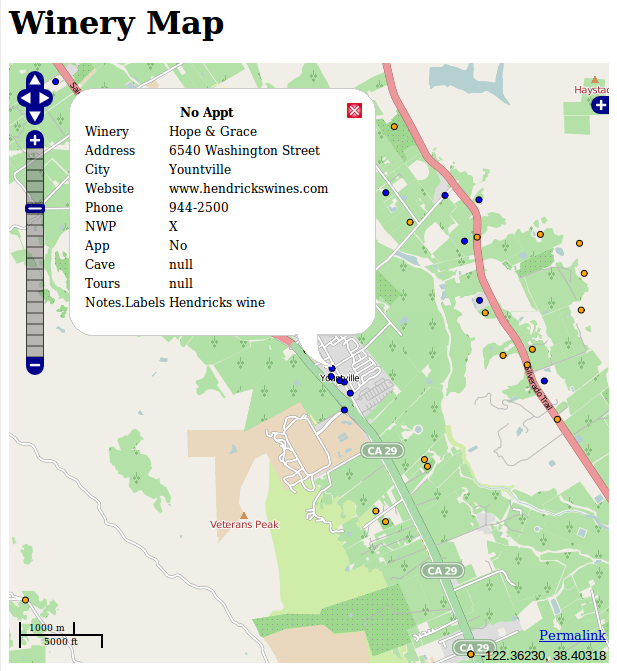 If you decide to visit a winery, you've then got to do some spatial query to find out the name and address. That's not very useful. 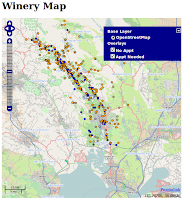 One poster on Dave's blog asked if it could be linked to Google Vis to produce a dynamic map. Well, better than that. We can use R to create a web map with all open source tools and open data. My off-CRAN package, webmaps has two capabilities - it can download map tiles like ggmap, and it can create slippy webmaps using OpenLayers. Recent changes to OpenLayers have however broken the slippy map functionality, and I'm working on a dedicated replacement package called openlayr. 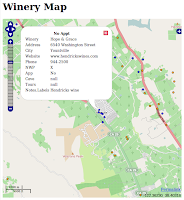 However, enough of the webmaps functionality exists to give me a good start on making a dynamic map of the wineries. up pops the information. Remember apart from those s1 and s2 objects and a bit of standard dataframe manipulation, this is one line of R.
The background imagery is an OpenStreetMap tile background - so I really need to add an attribution to this. Copyright OpenStreetMap Contributors, CC BY-SA. Its also possible to add other base-layers, such as the oooh-inducing Stamen.com watercolour maps. With a bit more customisation you could make the popups automatically link to the winery web page! This is how easy it is to make a web map with R - remember you can push this onto a web server and anyone can see it. Fabulous - can the maps produced by your package be pre- or post-manipulated with ggplot, as is possible with ggmaps or via autoplot from ggplot? Different problem space. ggplot produces static plots intended for statistical graphics purposes. What I'm doing here is creating dynamic web maps for exploration and interaction. Or have I missed your point entirely? Tried my demo? openlayr sounds like a really good idea. it may be useful even outside the spatial context. One layer for data, one for the model prediction, one for the standard errors..